This simple breakfast is perfect when you want to make something hearty in a hurry! Whisk the eggs and milk together in a small bowl and season with salt and white pepper. Place a small pot on a medium heat. Pour in the eggs and milk and cook for 2 to 3 minutes, stirring constantly, until soft. Add the butter at the last minute. 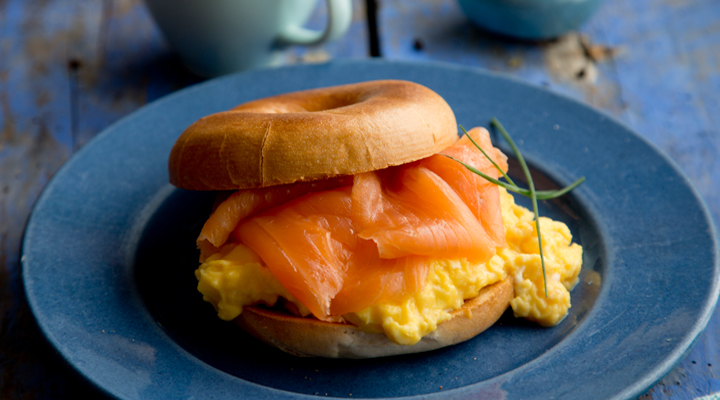 Top each of the toasted bagel halves with the scrambled egg, then drape the smoked salmon on top and serve straight away.